ATTENTION! : If you have an all-in-one pull-out type faucet, Click Here to verify if you're able to connect this system. Customers outside USA: Click Here for Shipping Discount. Looking for a Space-Saving UnderCounter Version? Click Here. *Addresses the major radioisotopes from Fukushima Disaster. h. Chromium 6 & other + charged metal ions. a. Raises/Balances pH to Alkaline. d. Improves Negative Redox (Antioxidant potential of water). g. "Instant & Constant" Fresh Water Flow. h. Easy & Quick Install. *Our systems should not be used with micro-biologically unsafe water, or water that has not been approved for drinking by local, state or federal authorities. 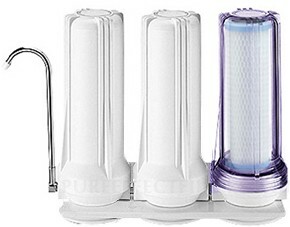 The Pure Effect ULTRA is a World-Class, Professional-Quality Water Filtration and Revitalization system, manufactured monthly in limited quantities due to the attention to quality and detail that each system demands. Each ULTRA system features our breakthrough Anti-Radiation, Alumina-Free Fluoride Removal and Natural Alkalization Technologies, and is iintelligently designed to replicate the condition of clean and nutritious water as found in pristine nature, it facilitates Alkalization, Ion-Exchange, Mineralization, Piezoelectric and Anti-Oxidation activity. This system not only filters the widest range of contaminants, but also raises alkaline pH gently and naturally by a process similar to how water picks up it's alkaline minerals in nature, as it flows over riverbeds, all for just a fraction of what water ionizer machines (artificial alkalization) cost. It also features a built-in flow regulator (a commonly overlooked, but crucial feature) to ensure the water's not passing through the system too quickly, this in turn provides optimal contact time with filtration media and more effective contaminant absorption. This is a powerful "All-in-One" solution for water revitalization and wide-range modern day contaminant elimination. PHASE 1: (Chemicals & Sediment) The 1st transparent blue/purple chamber which the water enters features our latest innovation, The SuperBlockTM , a 0.5 Micron Carbon block consisting of not 1, but 2 different types of Catalytic-Grade Activated Carbon, yielding the micro, macro and meso pore diversity that is not found in most carbon block cartridges on the market. This innovation results in our carbon block's ability to capture an unparalleled super wide-range of various chemicals, making this cartridge up-to 15x more effective than regular activated carbon blocks at removing Chloramine for example, and over 2x more potent than even some catalytic activated carbon blocks. It also provides nominal removal of microbial cysts and fine sediment about 100x smaller than the width of human hair, and is infused with the natural KDF55 media to discourage bacterial growth and fouling, which often happens with low-end carbon blocks. PHASE 2: (Fluoride) Next, the water enters the 2nd chamber, where an entire cartridge is dedicated to Fluoride Reduction using our advanced FluorSorb-MAXTM (alumina-free, all-natural) media. It consists of Activated Carbon Bonded with a unique Calcium Substrate which is capable of effectively absorbing the negatively charged fluoride ions. This proprietary fluoride removal technology was developed by us as a result of over 6 years of research, and far exceeds the commonly used Activated Alumina media in performance, efficacy and safety. - Natural Zeolite and Calcium release trace Electrolytes & Minerals, in-turn, helping to raise pH by a factor of 15, (apx. from 7.0 to 8.5) to make water more nutritious, naturally alkaline and pH balanced. - Improves Negative REDOX (antioxidant potential) by charging the water with extra electrons (subatomic negative charges), turning your water into a natural free-radical fighter, which may help slow the human aging process. This is due to the electrochemical process that takes place using the patented KDF55® Media. This system easily connects to your faucet using a special diverter in place of your current aerator, and by turning the small lever up it redirects cool/cold water through the filter when needed, and by turning the lever down, it allows you to continue to use the faucet for doing dishes, etc. The filter unit body is NSF Certified and made of BPA-Free & Phthalate-Free Precision-Machined, High-Strength Plastics, the Spout is Stainless Steel (non-corrosive). The bracket which holds the system together is made of Stainless Steel with a white coated finish, and will not rust over time (as often occurs with regular steel brackets used in inferior systems); Some filter companies even use plastic brackets which easily crack and break. We do not cut corners on quality. By purchasing any of our products, you will also be supporting the US economy, workers and our company. *If you do not have Fluoride in your water supply, you will still benefit from this system, since our unique FluorSorb-MAX(tm) media in this system also addresses negatively charged radioisotopes like Plutonium and Uranium, providing a wide-spectrum of radiation filtration, as well as Arsenic and other contaminants, and, because it is a calcium based media, it helps raise alkaline pH naturally. Filter Replacement: Every 6-12 months (dependent upon usage) for consistently superior performance. Filtered Water Flow: Apx. 0.5 Gallon/Minute. *Contaminant removal % based upon internal and/or independent laboratory water analysis. Individual results may vary. **Our filter systems are designed to be used only with water that is approved for drinking by the local, state and/or federal regulations.